Technology and communications company ipadio has today launched a free iPhone and iPad app for journalists. The iOS app follows the Android app released in December. The new app was announced at news:rewired, Journalism.co.uk's digital journalism conference which is taking place in London today. 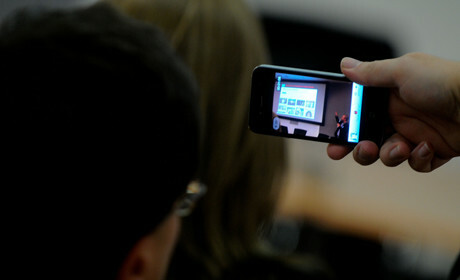 The iPhone and iPad app allows journalists to record and share audio and video; the Android version also has in-app editing. Both apps have integration with SoundCloud, YouTube, and iTunes, as well as Facebook, Twitter, Tumblr, Wordpress, Blogger and LiveJournal. The app is designed as a "toolkit for journalists", Mark Smith, co-founder and chief executive of London-based ipadio told Journalism.co.uk, and "provides reporters with a complete suite of tools facilitating live reporting in the field". One of the features that sets the ipadio app apart from many others is that it allows audio and video to be uploaded even in areas where there is no 3G or WiFi connection. "We've gone out of our way to box clever with bandwidth, so even in a poor data region the files keep on being uploaded," Smith explained. The London-based company, which launched four years ago, is best known for phonecasting, and the new app incorporates additional features including the ability to record and share video clips and cross-post to a range of social media platforms. The app also provides a 'file a story' feature to allow reports with associated images to be filed directly from a phone or tablet. The report is posted to your ipadio account and can be directly filed to your editor. The audio features allow journalists to make and record phone calls, as well as record and publish podcasts with associated images, text, photos and geolocation. The first live broadcast for ipadio was in 2009 and, according to Smith, was used for the first live report from the Haitian earthquake, which happened in January 2010. Last year ipadio was commissioned by the Olympics organising committee Locog to create an app for Paralympians to film and upload videos. An example of such a video is at this link.